This is a 7 nights and 8 days break in the Burgundy area of France. 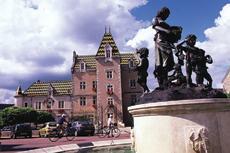 The tour starts and finishes in Beaune and includes stop overs in Rully, Buxy and Nolay. All stops include Bed & Breakfast and evening meals are included in Rully, Buxy and Nolay. The cycling is graded as Moderate, as it covers mainly flat and gently rolling countryside, but with some hills of moderate scale. No stage exceeds 55km, although optional routes are available on 3 days, which can stretch to 70km. All of the hotels on this route are 2* and 3*, with en suite facilities, and pride themselves on their good food. Bike Hire is available at 85 Euros. Price includes a Euro currency surcharge of £30.59 (£15.93 on single supplement). Helmets and water bottles are not included. Enter your review below and click submit.